Don’t get tricked: Why it pays to read original sources. In my last blog post I suggested that you can have confidence in the effectiveness of your clinical practice if you select treatment practices that have been validated by research. Furthermore, I provided links to some resources for summaries of research evidence. In this blog post I want to caution that it is important to read the original sources and to view the summaries, including meta-analyses, with some skepticism. Excellent clinical practice requires a deep knowledge of the basic science that is the foundation for the clinical procedures that you are using. Familiarity with the details of the clinical studies that address the efficacy of those procedures is also essential. I will provide two examples where a lack of familiarity with those details has led to some perverse outcomes. Two decades ago it was quite common for children who were receiving services from publically funded providers in Canada to receive 16-week blocks of intervention. Then we went through the recession of the nineties and there was much pressure on managers in health care to cut costs. Fey, Cleave, Long, and Hughes (1993) conveniently published an RCT demonstrating that a parent intervention was just as effective as direct intervention provided by the SLP to improve children’s expressive grammar – the icing on the cake was that the parent-provided service required half as many SLP hours as the direct SLP-provided service. All across Canada, direct service blocks were cut to 8 weeks and parent-consultation services were substituted for the direct therapy model. About a decade after that I made a little money myself giving workshops to SLPs on evidence based practiced. The audiences were always shocked when I presented the actual resource inputs for Fey et al.’s interventions: (1) direct SLP intervention – cost = 40 hours per child over 20 weeks, versus (2) parent administered intervention – cost = 21 hours per child over 20 weeks. So you see, the SLPs had been had by their managers! The SLPs would have been better positioned to resist this harmful change in service delivery model if they had been aware of the source of the claim that you could halve your therapy time by implementing a home program and get the same result. I don’t know that our profession could have changed the situation by being more knowledgeable about the research on service delivery models because the political and financial pressures at the time were extreme – but at least we and our patients would have had a fighting chance! Another reason that you have to be vigilant is that the authors of research summaries have been known to engage in some sleight of hand. An example of this is chapter on Complexity Approaches by Baker and Williams in the book Interventions for Speech Sound Disorders in Children. This book is pretty cool because each chapter describes a different approach and is usually accompanied by a video demonstration. Each author was asked to identify all the studies that support the approach and put them on a “levels of evidence” table. As indicated in a previous blog post, the complexity approach to selecting targets for intervention is supposedly supported by a great many studies employing the multiple probe design which is a fairly low level of evidence because it does not control for maturation or history effects. In the Baker and Williams “levels of evidence” table all of these single subject studies are listed so it looks pretty impressive. The evidence to support the approach looks even more impressive when you notice that two randomized controlled trials are shown at a higher level on the table. This table leads you to believe that the complexity approach is supported by a large amount of data and the highest level of evidence until you realize that neither of those two RCTs, Dodd et al. (2008) and Rvachew and Nowak (2001), support the complexity approach. Even when you read the text, it is not clear that these RCTs do not provide support for the approach because the authors are a bit wafflely about this fact. Before I noticed this table I couldn’t understand why clinicians would tell me proudly that they were using the complexity approach because it is evidence based. It is pretty hard to keep up with the evidence when you have to watch out for tricks like this! We tested this hypothesis in our RCT. Each child received a 15 item probe of their ability produce all the consonants of English in initial, medial and final position of words. The phonemes that they had not mastered were then ordered according to productive phonological knowledge and developmental order. Michele Nowak selected potential treatment targets for each child from both ends of the continuum. I independently (blindly, without access to the child’s test information or knowledge of the targets that Michelle had selected) randomly assigned the child to treatment condition, either ME or LL. ME condition means that the child was treated for phonemes for which the child had most knowledge and which are usually early developing. LL condition means that the child was treated for phonemes for which the child had least productive phonological knowledge and which are usually late developing. The children were treated in two six week blocks with a change in treatment targets for the second block using the same procedure to select the targets. The figure below shows probe performance for several actual and potential targets per child: the phoneme being treated in a given block, the phoneme to be treated in the next block (or that was treated in the previous block) and the phonemes that would have been treated if the child had been assigned to the other treatment condition. As a clinician, I am interested in learning and retention of the treated phonemes, relative to maturation. As a scientist who is testing the complexity approach, Gierut is interested in cross-class generalization, regardless of whether the child learns the targeted phoneme. We can look at these two outcomes across the two groups. Let’s begin with the question of whether the children learned the target phonemes and whether there is any evidence that this learning is greater than what we would see with maturation alone. In the chart, learning during treatment is shown by the solid lines whereas dotted lines indicate periods where those sounds were not being treated. A1 is the assessment before the first treatment block, A2 is the assessment after the first block and before the second block, and A3 is the last assessment after the second treatment block. On the left hand side, we see that the ME group was treated during the first block for phonemes that were mastered in one word position but not in the other two (average score of 6/15 prior to treatment). The slopes of the solid versus dotted lines show you that change from A1 to A2 was greater than change from A2 to A3. This means that these targets showed more change when they were being treated in the first block than when they were not being treated during the second block. During the second block, we treated slightly harder sounds that were not mastered in any word position, with a starting probe score of 3/15 on average. These phonemes improved from A1 to A2 even though they weren’t being treated but the rate of improvement is much higher between A2 and A3 when they were being treated. Interestingly, the slopes of the solid lines and the slopes of the dotted lines are parallel – this is your treatment effect – this is the proof that treatment is more effective than not treating. As further proof we can look at the results for the LL group. We have a similar situation with parallel solid and dotted lines for the phonemes that were treated in the first and second blocks at the bottom of the chart. We don’t have as much improvement for these phonemes because they were very difficult, unstimulable late developing sounds (targets that are consistent with the complexity approach). None-the-less the outcomes are better while the phonemes are being treated than when they are not (in fact there are slight regressions during the blocks when these sounds are not treated). At the same time, the phonemes for which the children have the most knowledge improve spontaneously (Gierut would attribute this change to cross-class generalization whereas I attribute this change to maturation). The interesting comparison however is across groups. 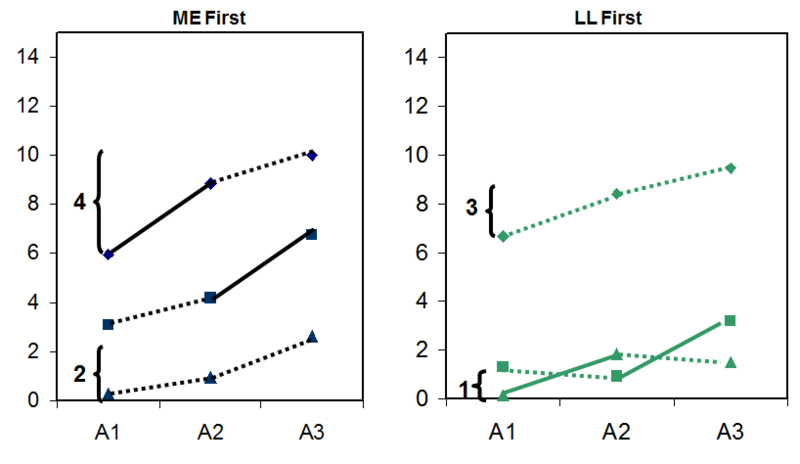 Notice that the ME group shows a change of 4 points for treated “most knowledge” phonemes versus a change of 3 points for the untreated “most knowledge” phonemes for the LL group. This is not a very big difference but none-the-less, treating these phonemes results in slightly faster progress than not treating them. In our 2001 paper we reported that progress for treated targets was substantially better for children in the ME condition than for children in the LL condition (in the latter group, the children remained unstimulable for 45% of targets after 6 weeks of therapy). However, the proponents of the complexity approach are not interested in this finding. If the child does not learn the hard target that is an acceptable price to pay if cross-class generalization occurs and the child learns easier untreated phonemes. If you look at the right hand side of the chart by itself, the chart can be taken as support for the complexity approach because spontaneous gains are observed for the “most knowledge” phonemes. The problem is that the proponents of this approach have argued that exposure to “simpler input actually makes language learning more difficult” – it is literally supposed to be impossible to facilitate learning of harder targets by teaching simpler targets. Therefore the real test of the complexity approach is not in the right hand chart. We have to compare the rate of change for the unstimulable targets across the two groups. It is apparent that the gain for UNTREATED unstimulable phonemes (ME group, gain = 2) is double that observed for TREATED unstimulable phonemes (LL group, gain = 1). The results shown on the left clearly show that treating the easier sounds first facilitated improvements for the difficult phonemes. I have explained this outcome by reference to dynamic systems theory in Rvachew and Bernhardt (2010). From my perspective, it is not just that my RCT shows that the complexity approach doesn’t work. It’s that my RCT is just part of a growing and broad based literature that invalidates the “learnability approach” altogether. Francoise and I describe and evaluate this evidence while promoting a developmental approach to phonology in our book Developmental Phonological Disorders: Foundations of Clinical Practice. The larger point that I am trying to make here is that SLPs need to know the literature deeply. The evidence summaries tend to take a bit of a “horse race” approach, grading study quality on the basis of sometimes questionable checklists and then making conclusions on the basis of how many studies can be amassed at a given level of the evidence table. This is not always a clinically useful practice. It is necessary to understand the underlying theory, to know the details of the methods used in those studies, and to draw your own conclusions about the applicability of the treatments to your own patients. This means reading the original sources. In order to achieve this level of knowledge we need to reorganize our profession to encourage a greater number of specialists in the field because no individual SLP can have this depth of knowledge about every type of patient that you might treat. But it should be possible to encourage the development of specialists who are given the opportunity to stay current with the literature and provide consultation services to generalists on the front lines. Even if we could ensure that SLPs had access to the best evidence as a guide to practice however, there are some “common factors” that have a large impact on outcomes even when treatment approach is controlled. In my next post I will address the role of the individual clinician in ensuring excellent client outcomes.